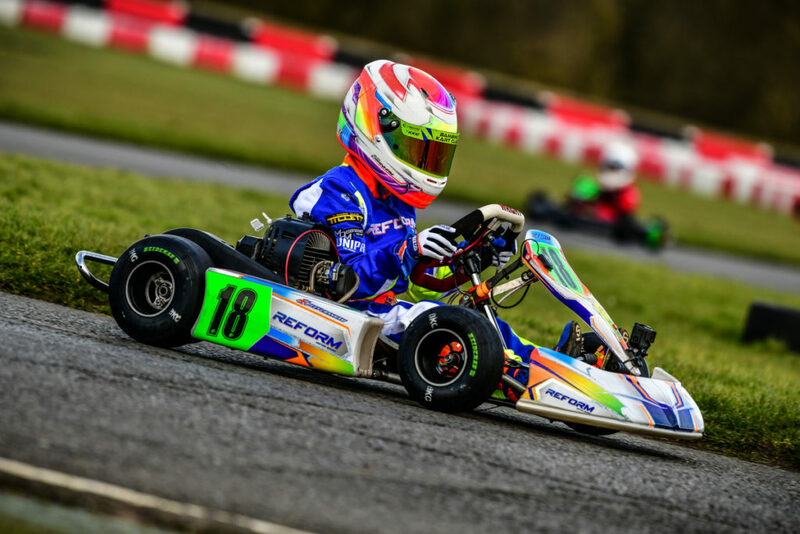 Riley Cranham has been crowned 2018 BKC series Iame Bambino Champion. In a Championship that has been dominated by the Wright Centaur chassis, there was one star that shone just a little brighter than the others. From the very start of the season it was clear that the Championship would be a very competitive one, and consistency of performance would be key. With the Championship in full flow by round seven, and points ebbing to and fro, it looked as though it would be one of three: Riley Cranham (Wright Centaur, 516 pts), Connar Scarisbrick (502 pt) or Jacob Ashcroft (475 pts). However the following two rounds saw Scarisbrick and Ashcroft drop vital points, meaning an unassailable lead (after dropped rounds – 8 from 10 rounds to count) going into the last round for Cranham. With torrential rain forecast throughout the day at the final round (Fulbeck) and the top three in the Championships secured both Riley and Connar sat it out, and Officially crowned Riley 2018 Iame Bambino, BKC series Champion! Riley entered the Bambino class in 2016, his early days in the up and coming premier Bambino Championship (BKC) were used as a steep learning curve, littered with highs and invariably lows. 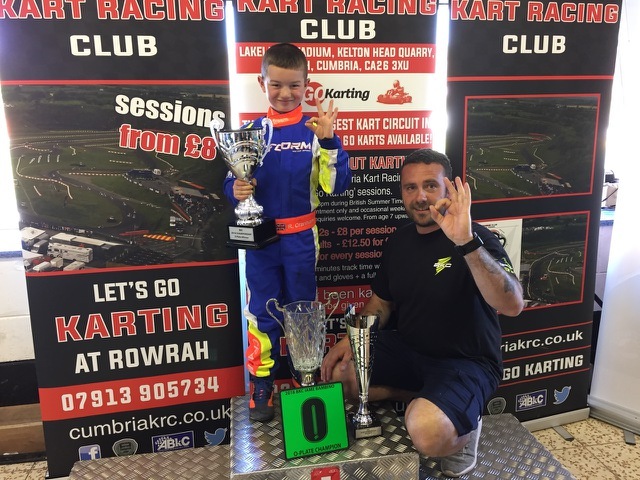 The turning point of Riley’s Bambino career proved to be the 2017 “GP Plate” victory (Using his Wright Centaur), at Cumbria Kart Club (Rowrah). The victory acted as catalyst for Rileys Bambino career, with the team of Riley, his dad (Mark) and mechanic (Chris) now with the experience of a big win, more success was to follow. Following up on his 2017 “GP” Plate Championship, Riley repeated the feat again in 2018. The year was to get better and better, winning the “GP” plate, “O Plate” and culminating in the big prize, the BKC series Iame Bambino Championship, all of which were achieved using his Wright Centaur chassis. Riley Cranham – 2018 “O” Plate Champion (With BKC’s Darren Beavers). He looks forward to new challenges in cadets next year and hopes that the last 3 years in Bambinos will help him on his cadet journey.